How are Latin American capital markets behaving some weeks before the starting of the 2018 electoral cycle? This blog shows that, beyond certain heterogeneity across countries, financial markets in the region remain relatively calm. With volatility in global markets and sovereign bond spreads in Latin America below the maximum reached during the tapering episode of 2013 and other international events, including Brexit and US past presidential elections, Latin America is entering the 2018 electoral year in relatively good conditions. The monitoring of several financial variables in the upcoming weeks will be crucial. Political cycles are a core moment for financial markets. Although this is especially evident in emerging and developing economies, such as Latin American countries, this does not mean that these do not have resonance on financial markets from developed countries. Financial markets react to political events, whether cabinet reshuffling or elections, to public policies – sometimes affected by political campaigns -, and tend to be particularly sensitive to the uncertainty of election outcomes, often overshooting in terms of spreads, foreign exchange and interest rate volatility. Fear of the unknown lies behind the impact of political events on financial markets. First, there is the fear that incumbent parties adopt expansionary economic policies prior to elections to attract voters. Second, there are doubts about the credibility of candidates’ economic policies, due to perceptions on the lack of commitment of emerging democracies’ governments and political parties to credible and stable economic policies. On top of that, the over‐reaction of financial markets to democratic elections raises the issue of the political preferences of financial actors. After some electoral processes in 2016 and 2017, the political cycle in Latin America will be dense this year. In this context, monitoring Latin America’s financial markets is paramount. It starts in February with presidential elections in Cuba and Costa Rica (first-round), followed in March by parliamentary elections in Colombia, in April presidential elections in Paraguay, Costa Rica (second-round) and Venezuela (during this first quarter, date to be determined), in May (first-round) and June (second-round) presidential elections in Colombia, in July presidential elections in Mexico, and finally in October presidential elections in Brazil (first and second-rounds). 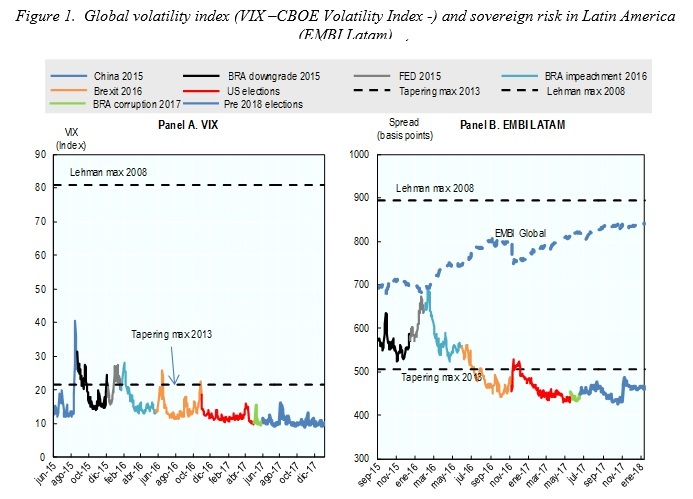 Setting as benchmarks the tapering episode of 2013 and the global financial crisis in 2008, Figure 1 shows two key financial indicators, the VIX (CBOE Volatility Index), a proxy of the standard market volatility in international capital markets, and the EMBI (Emerging Bond Index) of Latin America. Note: Data up to January 12 2018. The episode of China 2015 refers to the financial volatility observed in the 2015 summer due to brewing doubts about the pace of the Chinese economy. Brazil downgrade 2015 refers to the economic slowdown coupled with its credit rating downgraded on September 9 2015. The FED 2015 episode refers to rise in interest rates by the FED. The BRA impeachment 2016 refers to the impeachment process of Brazil’s former president Dilma Rousseff. The Brexit 2016 episode refers to the 2016 referendum where the UK citizens voted for the withdrawal of the United Kingdom from the European Union. The US elections episodes, refers to the presidential elections held in the United States in November 16. The BRA corruption refers to the Odebrecht corruption scandal. Finally, the Pre 2018 elections refers to the current months before the 2018 electoral cycle in the region. Source: OECD Development Centre using data from Datastream. In a nutshell, after some spikes notably after volatility in China during the summer of 2015, FED start of the normalisation cycle in early 2016, Brexit and continued political turmoil in Brazil, volatility in global markets has continued to decrease and seems contained, even including Brexit and US past elections. The story is similar focusing on the sovereign bond spreads in Latin America, measured by the Emerging Markets Bond Index (EMBI Latam). It is well below the highs reached after the FED start of the normalisation cycle in early 2016 and President Rousseff impeachment in Brazil. 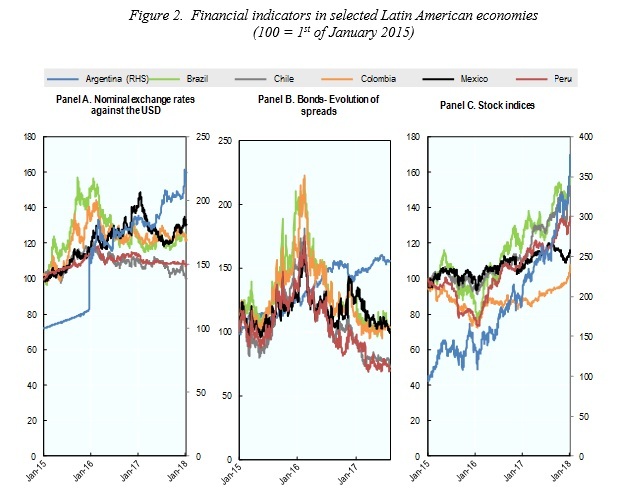 Digging deeper into the heterogeneity in Latin America, Figure 2 presents the evolution of key financial variables in selected Latin American economies since January 2015, characterised by general nominal appreciations and stock exchange gains, with mixed results on bond spreads. In particular, relative to LAC currencies the USD appreciated in Argentina (40%) since the peso was allowed to float in December 2015 (118% for the full sample), Colombia (20%), Mexico (29%) and Peru (8%) between January 2015 and January 2018; with Chilean peso remaining stable (Panel A). Sovereign bond spreads have improved for Brazil (-13%), Chile (-34%), Colombia (-16%), and Peru (-46%); while deteriorated in Argentina (67%) and Mexico (2%) (Panel B). Yields in stock markets (in local currency) increased in all economies covered; Argentina (281%), Brazil (59%), Chile (53%), Colombia (5%), Mexico (14%) and Peru (36%) (Panel C). Note: Data up to January 12th 2018. In sum, so far, although some heterogeneity across countries, financial markets in the region remain relatively calm. With volatility in global markets and sovereign bond spreads in Latin America below the maximum reached during the tapering episode of 2013 and other international events, including Brexit and last US presidential elections, Latin America is entering the 2018 electoral year in relatively good conditions. The monitoring of several financial variables in the upcoming weeks and months will be crucial.